Elimination Communication (EC)- also known as Infant Potty Training (IPT), Elimination Timing (ET) and Natural Infant Hygiene- is how most babies are brought up around the world. This ‘method’, which is so obvious in most cultures that it needs no name, involves the mother and baby becoming attuned and communicative so that the mother (and/or other caregivers) know when the baby needs to eliminate- pee or poo. I first heard the phrase Elimination Communication when my fourth baby Maia Rose was 3 months old, and a friend pointed me towards an EC website. I was very excited about it as I had read in a letter to Mothering magazine (US) a few years earlier, that African women cue their babies to eliminate with a ‘psss’ sound, and I had begun to do this with Maia from birth. I was drawn to the idea of a deeper physical and psychic connection with my baby, and EC felt closer to our genetic imprint. The first time I tried it, I held Maia (aged 3 months) over the laundry tub, and made the ‘psss’ noise. To my delight, she peed straight away, and we have been doing it ever since. It has been more rewarding for our family than I could have imagined. It has given us more skin-to-skin contact, less washing, no diaper/nappy rash, and, best of all, a deeper respect for Maia’s abilities and a finer attunement to her rhythms. There is obviously less waste and a better time for Mother Earth; and it’s fun! After having three babies in diapers/nappies , I have been constantly delighted at Maia’s ability to communicate her needs, and to keep telling me until I get it. Elimination Communication also makes a beautiful contribution to my experience of mindfulness in my mothering. Like breastfeeding, it keeps me close to my baby, physically and psychologically, and provides very immediate feedback when I am not tuned in. From the start, I had a lot of support from Emma (then 10), Zoe (7) and Jacob (5), who told me how much they disliked sitting in wet or soiled diapers/nappies as babies. Some believe that our society’s sexual problems may begin when our babies learn to switch off from their genital area because of the unpleasant sensations of wearing a “walking toilet.” My partner Nicholas wondered about the extra effort that I went to in the first year, but has been very happy to reap the benefits of a diaper/nappy-free toddler. At other times, it was more psychic, and I found myself heading for the laundry tub, where we usually eliminated, without really thinking. When I was distracted, or delayed acting on my hunch, I usually got peed on. (However, she very seldom peed on me when I carried her in a sling) Her signal for poop was usually few farts, or sometimes she’d even pull off the breast as a means of signalling that she needed to go. She didn’t want to sit in her own poop! In her first year, we used the laundry tub by preference. I’d hold her upright by her thighs, with her back resting on my belly. A small sandpit-type bucket with a conveniently concave lip was also useful; I’d sit and hold it between my thighs, supporting Maia above it. The blue bucket- which became a family icon- has been very well travelled, and also came into its own at night later on- see below. As she got older and heavier, I found that sitting her on the toilet in front of me worked well- sometimes we’d have a ‘double pee’, which was always successful if nothing else worked! Along with the position, I cued her with my ‘psss’ noise, and sometimes at the tub, when she was slow to start, I’d run some water as well. After 3 months or so of doing this, I became more sure of my interpretation and I would sometimes gently persist, even when she was reluctant, and usually she’d eliminate. However it’s a fine line, and it’s vital to have cooperation, and not a battle of wills, which can sometimes develop around ‘toileting’. EC is a dance of togetherness that develops, as with breastfeeding, from love and respect for each other. On a practical level, I used diapers/nappies when we were out and about (I love those Weenies pilchers! ), and peed her as much as I could, but I didn’t expect to be perfect in these, or any, circumstances. We used toilets or took the bucket (or a plastic container with a tight lid) in the car. When we missed a pee, my reaction was just, “Oh well, missed that one.” On hot days, I would lay a flat cloth diaper/nappy on the car seat. If it wasn’t convenient to stop, I’d say to her, “Oh, Maia, you’ll have to pee in the nappy, and I’ll change it as soon as we stop.” Maia didn’t like to be disturbed at night in the early months, so I’d lie her on an absorbent cotton rug and just let her pee. I changed this whenever I woke up. (I also had a hot-washed woollen blanket underneath as a waterproof protection for the mattress.) Or I’d wrap a cloth diaper/nappy loosely around her bum and change it when wet. I found that, as with naps, she usually peed on awaking and then nursed. Around 6 to 7 months, Maia went ‘on strike’, coinciding with teething and beginning to crawl. She stopped signaling clearly and at times actively resisted being peed. I took it gently, offering opportunities to eliminate when it felt right and not getting upset when, after refusing to go in the laundry tub, she went on the floor. Even on bad days, though, we still had most poops in a bowl, bucket or the toilet. At nearly 10 months, we were back on track. I noticed that as she became more independent and engrossed in her activity, she was not keen to be removed to eliminate, so I started to bring a receptacle to her. She preferred a bowl or bucket on my lap, and later we began to use a potty: I initially held her while she used it. At nighttime, I started sitting her up on the blue bucket (and on the breast at the same time; tricky to lie down afterwards and not spill the bucket!). When I was less alert, she peed on a nappy between her legs and/or the cotton rug underneath her. There was a marked shift soon after she began walking at 12 months, and by 14 months, to my amazement, Maia was out of diapers/nappies completely. She now was able to communicate her needs very clearly, both verbally and non-verbally, and her ability to hold on was also enhanced. 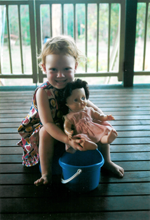 When she needed to eliminate, she said “pee” and/or headed for the potty–we had several around the house. She began to be very interested in the fate of her body products, and joined me as we tipped it onto the garden or into the toilet. Later she wanted to ‘tip it’ and even began to get a cloth and wipe up after herself! With this change, I stopped using diapers/nappies altogether, and switched to trainer pants for outings. Dresses were great too, for summer outings with bare-bottomed girls. By the middle of her second year, Maia was totally autonomous in her daytime elimination. She could tell us her needs (with lots of warning) and/or go to the potty herself. Night times continued to be busy for us, with lots of feeding and peeing, but, unless she was unwell, or I was very tired, we had very few misses, and sitting up at night to pee her seemed to me a small effort in return for the benefits we were reaping. It seems, from other stories, that many EC babies stop peeing at night even in the first year, or have a predictable pattern (e.g. not peeing after midnight). I made the choice to not restrict nighttime feeding, which obviously produced more pee! Compared to my other babies, Maia has been a very light sleeper, day and night. Around age 2, I began to persuade her to wake less frequently by refusing to feed her until early morning, and with this, she stopped peeing most nights. For me, the beauty of elimination communication has been in the process, not in the outcome. Yes, it’s been great to do less than a full load of washing each day for a family of six, but much more significant is the learning that mothers and babies are connected very deeply–at a ‘gut level’–and that babies (and mothers) are much more capable and smart than our society credits. If you feel drawn to EC, I encourage you to have a go. Look on the internet- it’s all I needed to get started, as well as invaluable on-going support. There are also several great books- see below-and you can ask other ECers, as well as mothers from cultures such as India and China, where this practice is still widespread. Although it can be more complex for older babies, some of whom may have already learned to ignore their body’s signals, others may welcome the chance to communicate their elimination needs. I wish you ease, pleasure, and mindfulness in your mothering. 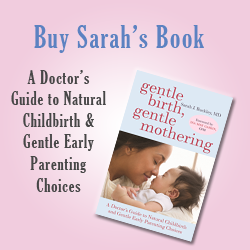 At gentlenaturalbirth.com we have more great resources about EC, including a one-hour webinar and resources pages that you can access at your leisure as a GNB member! You can see all the resources here.